The traditional British celebrations associated with the 1st May, dancing around the maypole, Morris dancers, the crowning of a May Queen have their origins in the Ancient Roman feast Floraliana and the Celtic celebration of Beltane on 30th April. Both were celebrations of the end of winter and the beginning of summer and celebrated the fertility anticipated for that season. The early Church attempted to discourage them but in many rural areas they continued until a Puritan controlled Parliament banned the Maypole in 1644 and the Commonwealth government under Oliver Cromwell went on to ban May day celebrations, and indeed most other traditional celebrations such as Christmas and Easter. When Charles II was restored to the throne in 1660 the traditions were revived to some extent. The writer has, to date, found no information relating to any early May Day celebrations or traditions in Neston although this does not necessarily mean that there were none. Eighteenth century Neston would certainly have been busy around May time: fairs were held several times a year at Windle Hill on the outskirts of Great Neston from 1729 and one of them was at Whitsuntide and race meetings at Neston Races were held around the same time. 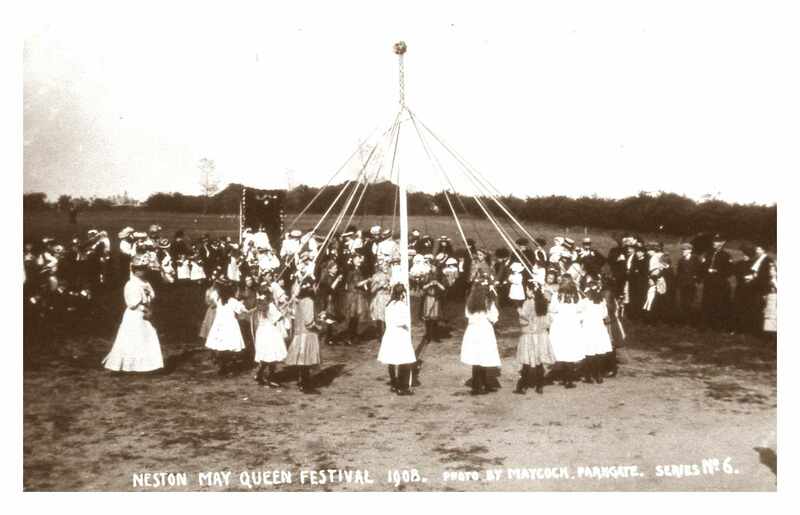 Some nearby Cheshire villages had maypoles which were the focal point of May games and celebrations: there was one at the village of Ashton, near Tarvin at the beginning of the seventeenth century and Chester had at least three, the best known one being at Handbridge which was a familiar landmark for over a century before it was removed in 1850. Festivities associated with the traditional date for May Day, the 1st May, gradually shifted to or merged with other celebrations later in the month: Oak Apple Day on 29th May which commemorated the restoration of the Monarchy or around Whitsun. The alterations to the calendar in 1752 (when eleven days in September were dropped from the calendar) also meant that 1st May, along with other key dates, occurred earlier in the year and for some time afterwards both old and new dates for May Day and Christmas etc were noted in almanacs and newspapers. Whit Monday was celebrated this city, with all the splendor and magnificence customary on the auspicious occasion! —All the laziness of the city was assembled in one locus in Handbridge, where dancing round the May-pole, was kept up till the influence of gin and ale brought many of the votaries of Terpsichore the ground. However, in 1829 the editor of the Chester Courant was more sympathetic and suggested that Tarvin’s new Vicar would eventually settle down and be sensible enough to display the same latitude as his predecessor had towards local May games. As the nineteenth century progressed May Day celebrations and customs enjoyed something of a revival though they were a more romantic interpretation of the pagan fertility traditions and May games. This revival may be credited to the influence of the leaders of the Romantic movement, poets and critics like Alfred Tennyson, Leigh Hunt and John Ruskin. Tennyson’s poem the May Queen, first published in 1833, was immensely popular. Dancing around a maypole was an old tradition but Maypole dancing involving the elaborate threading of ribbons around a Maypole was popularised by John Ruskin who introduced it at Whitelands College in 1881. Many of the events were aimed at children rather than adults, and some were associated with the Band of Hope, an organisation which began in Leeds in 1847 with intention of promoting temperance amongst working class children and educating them about the dangers of alcohol. Some Cheshire villages adopted the May Day celebrations with enthusiasm; in Cheshire Knutsford’s May Day festival was established in 1864 and continues still as the Knutsford Royal May Day. When the Bank Holidays Act was passed in 1871 May Day was not one of the four days designated as a Bank Holiday and what we now call the May Bank Holiday, the first Monday in May, was only added in 1978. However, in many areas, it continued as a local holiday. Neston may not have had a parade on the same scale as Liverpool’s May Day parade of elaborately decorated horses and wagons belonging to the Liverpool carters but in 1887 the first of a series of annual Donkey Shows was held in Neston, organised by the Royal Society for the Prevention of Cruelty to Animals. Prizes totalling £5 were awarded to the best kept Heswall, Neston or Parkgate donkey which had been worked during the previous year. Twenty-three donkeys were entered in the competition, all groomed and decorated with ribbons, and assembled at the Cross. The judging took place in front of a crowd of some four or five hundred people and with a fair amount of ‘good humoured banter’. Prizes were awarded to : — 1, Jane Sanders, Ness, 30s ; 2, Wm. Oxton, Little Neston, 20s ; 3, Joseph Price, Heswall, 15s ; 4, John Peters, Little Neston, 10s ; 5, William Roberts, Ness, 7s 6d ; 6, Elizabeth Morris, Ness, 7s 6d ; 7. Jane Williams, Little Neston, 5s; 8, Henry Woodhouse, Little Neston, 5s. It was suggested that in future years there should be a separate prize for the cocklers’ donkeys whose work was physically harder and this was reflected in their condition. COCKLE DONKEYS: 1, Sarah Abel, 20s; 2, Hannah Williams, 17s ; 3. John Oxton, 12s ; 4, John Peters, 9s ; 5, Richard Peters, 7s ; 6, Richard Peters (Great Neston), 5s. DRAUGHT DONKEYS: 1, Jane Sanderson, Ness, 15s ; 2, Elisabeth Campbell, Ness, 10s ; 3, Wm. Robinson, 5s. The shows continued for another few years but by 1891 interest was waning amongst the donkey owners although the show continued to be well supported by the local gentry. The judge in that year was Moses Robinson, the local veterinary surgeon, with Mr Motum Secretary of the Liverpool branch of the RSPCA. Amongst those attending were Rev. W. F. Barrett and Mrs. Barrett, Mrs. R. Bushell, Miss Congreve, Miss Samers, Miss Florence Dismore (hon. sec. of the Wirral branch of the RSPCA )Mr. and Mrs. De Wolf, Mrs. and Miss Seager, Miss Webb, Mr. W. Wright, Mr. W. Chambres, Mr..J. Gamon, Miss Higginson, Miss Richie, Mr. W. Youds, Mr. E. Molyneux, the Misses Gibson, the Misses Comber, Mr. R. Gleadowe, Mr. Williams, &c.
COCKLE GATHERERS Donkeys — 1, Job Peters, 15s. ; 2, Sarah Able, 12s. 6d. ; 3, Henry Wellings 10s. ; 4, Mary Murry, 9s. ; 5, Richard Peters, 7s 6, Joseph Bartley, 6s. DRAFT DONKEYS.— I, John Campbell, 10s. ; 2 Joseph Saunders, 8s ; 3, William Ashbrook, 7s. 4, John Pennington (Heswall), 5s. ; 5, Margaret Millett 5s. 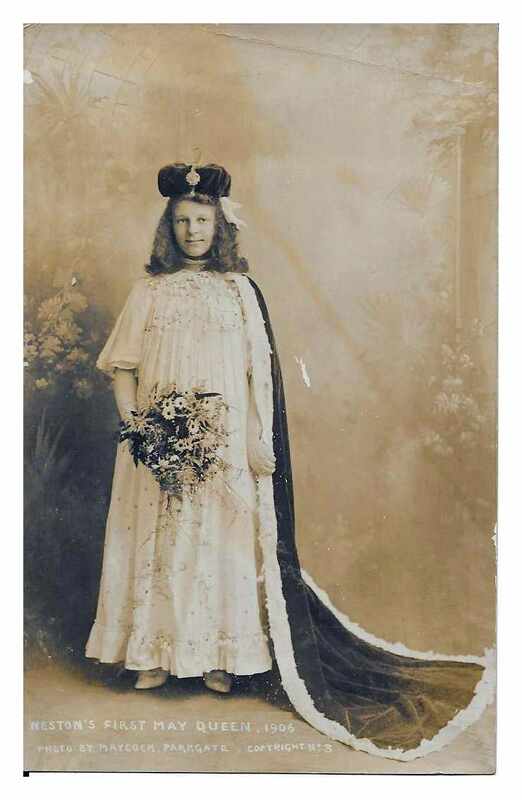 If Dunham on the Hill and Knutsford adopted the tradition of crowning a May Queen there was also an example nearer to home in Birkenhead which may also have, eventually, influenced Neston and Parkgate. The Charles Thompson Mission for Poor Children in Birkenhead had been established in Price Street in the mid-1880s before moving, in 1892, to the premises which it still occupies in Hemingford Street. From the beginning, the Mission’s crowning of the May Queen was one of the principal attractions of Birkenhead’s May Day parade and celebrations, the Queen and her followers being chosen from the children attending the Mission. For several years, the Mission put on an entertainment in Neston Town Hall to raise money for their funds with entertainment provided by the children and including the May Queen from the previous year and the one about to be crowned in the current year. Perhaps this performance in April 1893 was the inspiration for a similar entertainment in Little Neston in the following June, put on by the Band of Hope in the Ness Holt Schoolroom. When the Birkenhead Mission returned to Neston the following year, this time with Colonel Lloyd presiding, the evening was, unfortunately, marred by the behaviour of some Neston youths. The Mission’s entertainment continued to be an annual event in Neston for many years, even after Charles Thompson’s death in 1903 when his work was continued by his daughter, Annie. Neston’s continued support of Charles Thompson’s Mission in Birkenhead may be explained by Charles Thompson’s connections with Neston. When the Cheshire Observer announced his death in February 1903 it was under the heading ‘Neston Missioner’s Death’ observing that he had been at one time resident in Neston and had relatives still living there. His father, also Charles, had been an officer of the Inland Revenue and the family, originally from Surrey, moved around the country living in Derbyshire, Staffordshire and Knutsford in Cheshire before finally ending up in Neston. The 1871 Census shows Charles senior living in Brook Street with his wife Sarah and his widowed daughter, Louisa and her two children. Charles Thompson’s years in Neston must have been brief as he appears to have spent most of his adult life in Birkenhead where he was in business as a grocer in Price Street between 1871 and 1881 before founding and becoming superintendent of the Mission for Poor Children in the mid-1880s. However, his sister, Clarissa remained in Neston after their father’s death in 1876 and she had a shop selling fancy goods in Parkgate Road. She was also a Sunday School teacher at the Neston Mission Hall which stood on the site of what is now Neston Methodist Church. In 1884 she married William Houghton Tranter, a widower with young children. 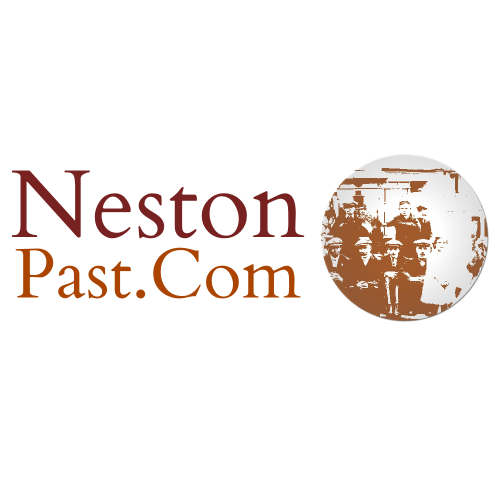 He had come to Neston as stationmaster but in the early years of their marriage he worked in the shop before being appointed clerk and rate collector for Neston and Parkgate Local Board and then secretary and care taker of the newly built Neston Town Hall. He was also an active member of the Mission Hall congregation where he was Superintendent and one of the trustees. William and Clarissa had two children, Charles Percival and Clarissa (Clara) and with their step brothers and sisters and their Birkenhead cousins, the Thompsons, they were involved in many of the Neston Mission’s entertainments and activities. The first local ceremony of crowning a May Queen appears to have been at Parkgate in 1894 but it continued for only a few years. In 1898 it was Clarissa’s daughter, Clara, who was chosen as May Queen. There is no mention of any similar ceremony in Neston until 1906 when the organisers of the Sunday School which was held in the Liberal Club in Hinderton Road (on the site of what is now the Civic Hall) decided to organise one for the children who attended. The building was opened in 1902 to provide sport and social activities in Neston as well as to accommodate a Neston Liberal Club. The idea was first proposed by A.G. Grenfell, Headmaster of Mostyn House School and supported by William Lever (later Lord Leverhulme) who was elected Liberal MP in 1906. The original plan for this first May Day event was for a procession around the town followed by a crowning ceremony on the Liberal Club fields, but the weather was so bad that the procession was much shorter than intended although it still attracted a good crowd of spectators. The procession was led by the Port Sunlight Silver Prize Band with the May Queen and her attendants following in a horse drawn landau. The crowning ceremony had to be moved to inside the Liberal Club where it was performed by Mrs Lever. Neston’s first May Queen was Jessie Parry and her trainbearers were Maudie Taylor and Nellie Thompson and her maids of honour were Gladys Wharam and Mollie Bates. 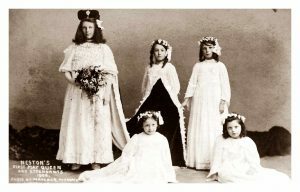 Postcards showing the May Queen and her attendants were produced and sold locally. One such postcard was sent to Mrs Morrison at Glenton House in Little Neston possibly by someone who was amongst the spectators as the message on the back is “A very wet Saturday. And bitterly cold. A most miserable dark day”. Mrs Morrison was Sarah Agnes Morrison, nee Hutchinson, the widow of Robert McGregor Morrison, a solicitor. He was a descendant of Ellen Pyke, one of the founder members of the Neston Female Friendly Society (see Neston Female Friendly Society – Are you a descendant of Ellen Pyke). Though spoiled to a great extent by the inclement weather the first May-day in Neston, held on Saturday, must be voted a success. Undoubtedly the return of the month of flowers was celebrated on the green in the mediaeval times, but Saturday’s festival was the first held during the present generation. The originators of the scheme appear to have been the people connected with the Liberal Club Sunday School. The ideas suggested were taken up with great avidity by the local people and excellent arrangements had been made. The programme drawn up included a procession through the district and a grand crowning ceremony in the Liberal Club fields. Only bright sunny day was needed to make the event one that would be long -remembered in the annals of the district. Unfortunately, the reverse was the case, and a more wretched day could not have been experienced. The elements were those usually associated with the months of October and November. Dull heavy clouds hung low in the horizon and a cold winterly wind blew in fitful gusts. As the day wore on rain fell heavily and continued without intermission until dark. This year’s Queen was Miss Jessie Parry, and throughout the proceedings she earned the goodwill of her subjects and the admiration of the onlookers for her graceful manner and her cheerful conduct. The procession, as arranged, had to be abandoned, but it was found practicable to make a short tour of the town. Even this much- shortened programme, however, gave Neston people an opportunity of displaying their interest. The short route was lined with spectators, and it was not hard to form an estimate of the numbers who would have participated had the day been fine. The procession was headed by the Port Sunlight Silver Prize Band, who were followed by a contingent of dancers. The May Queen, who followed in an open landau, accompanied by her attendants was an object of general interest. After the Queen came the remainder of the Maypole dancers, the rear being brought up by several decorated carts. This latter feature it is intended to extend in future years. It had been intended that as soon as the procession concluded Mrs. W. H. Lever should perform the crowning ceremony on the green in one of the fields and that it should be followed by the ancient May-pole dance and some sports. The proposal, however, was impossible owing to the drenching rain that fell. Nothing daunted the energetic committee provided accommodation for the ceremony in the Liberal Club. The Queen, attired in her State robes of white- spangled silk trimmed with snowdrops, her red velvet train, was seated on the throne. The parts of train-bearers were taken by Nellie¸ Thompson and Maudie Taylor, and Gladys Wharam and Mollie Bates made dainty little maids of honour in white Kate Greenaway frocks and daisy wreaths. The Maypole dancers, whose dresses were carried out in various flower shades, and who wore corresponding wreaths in their hair, were ranged round the throne, and after the coronation had been gracefully performed by Mrs. Lever, who presented her Majesty with book mementoes of the event, each child proceeded to pay homage. The grand red velvet and gilt crown was handed to Mrs. Lever by John Bates, the marshal, who wore an appropriate suit. At the conclusion of the ceremony, Mr. Johnson (the indefatigable club secretary) thanked Mrs. Lever for her attendance, leading the audience in three cheers for her. The spectators were then dismissed, and the little performers entertained to a substantial tea. he comfort of the children was well attended to by a number of ladies and gentlemen. A general desire has been expressed that the event should be made an annual one, and as far as can be judged, should this be the case the people of Neston will give to those responsible their whole-hearted support. The sports which were arranged in connection with the event were of necessity postponed. Great credit is due to Miss Constance Gill for the efficient way she had trained the children. The following are the names of the children who took part in the dancing: Gertie Newton, Annie Johnson, Gertie Jones, Jessie Harris, Annie Henshaw, Kate Williams, Grace Wharam, Annie Higgins, Susie Chrimes, Lily Swift, Emily Oxton, Lizzie Anyon, Eunice Griffiths, Emily Thomas, Emmie Kemp, Cissie McFarlane, Cissie Evans, Maggie Kemp, Olive Vickers, Gertrude Booth, Amy Evans, Maggie Williams, Ethel Thackray, and Millie Coventry. It was not until two years later that another such procession was arranged. It started at the Liberal Club and then proceeded down Parkgate Road to Parkgate before returning to the Club for the crowning ceremony. The May Queen chosen was Sybil Scarret and in this year a role had been found for boys as well: George Fewtrell, dressed in Scottish traditional costume, was one of the collectors who collected coins from the spectators along the way and Percy Large was one of the Queen’s attendants as a courier. Thanks to the efforts of Miss Gill the May Day revels were revived on Saturday. The procession started from the Liberal Club, or Social Club, headed by a brougham, in which the May Queen, pretty Sybil Scarrett and her little attendants formed a charming tableau. Following was a lurry laden with the Maypole dancers, and last of all was a gaily decorated cart, shewn by Mr. Williams, of Parkgate-road. The route taken included the Parkgate-road and Parkgate. Spectators turned out in goodly numbers to witness the display, and the collectors reaped a fair harvest of coins. The collectors, by the way, were a new feature, and a number of them wore striking costume. Jessie Parry, the last May Queen, had a prettily bell trimmed dress as “Folly,” and Grace Wharam made a vivacious little gypsy in her costume of red and yellow silk. Picturesque “Old English” costume was worn by Annie Fewtrell, Gertie Booth and Cissie McFarlane, and George Fewtrell, in a realistic Scotch costume, made a brave addition to the ranks of the collectors. On the return of the procession to the club the pretty ceremony of crowning the Queen was gone through, a field at the rear of the club having been lent for the purpose. The coronation was performed by Mrs. W. C. King, who presented her Majesty with a handsome book in memory of the occasion. Miss Gill, on whose shoulders the major portion of the work in connection with the festival has fallen, also presented the girl with a Bible. The charming picture formed by the Queen in her robes of white spangled silk and red velvet was very evidently fully appreciated by the large number of spectators who were present. 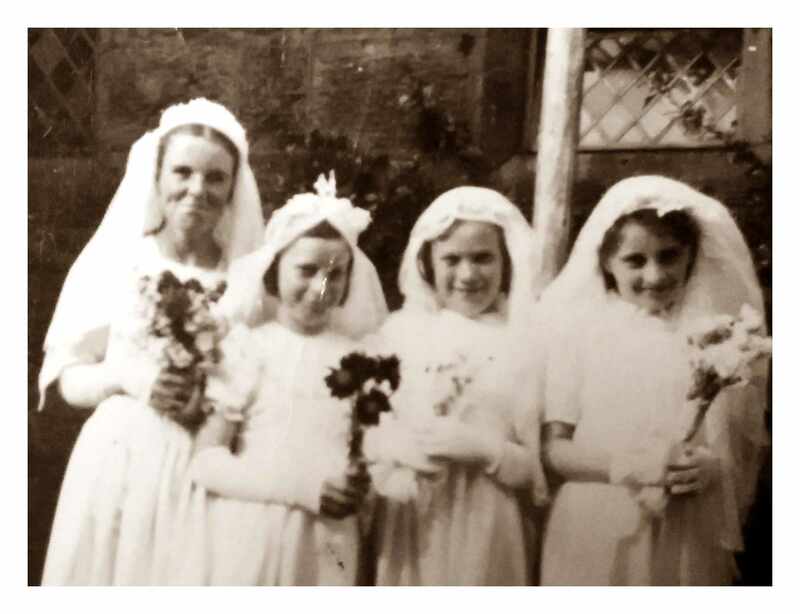 In attendance on the Queen were Gladys Wharam and Molly Bates (train-bearers), and Gwen Birch and Lily Large (maids of honour), who had dresses of white muslin and flower wreaths. Percy Large acted as courier to “Her Majesty”. At the conclusion of the crowning ceremony a number of girls, dressed in varicoloured muslin dresses, performed a graceful “garland” dance, and afterwards the Maypole dance was given. This dance reflected particular credit on Miss Gill and her assistant, Miss Florence Wharam, the children doing their part with charming grace, from which a few slips, almost incidental to a performance of the kind, in no wise detracted. A horn- pipe dance was. also included in the afternoon’s programme. During the afternoon the children taking part in the dancing were entertained at tea in the club, and Miss Gill was assisted in her arrangements for their reception by Mrs. Gill, Miss F. Wharam, and Messrs. Little, Bairds, Large, and Ethial Lloyd. The evening was concluded by a dancing on the green, the music for which was provided by the Port Sunlight band, which had been in attendance throughout the afternoon. 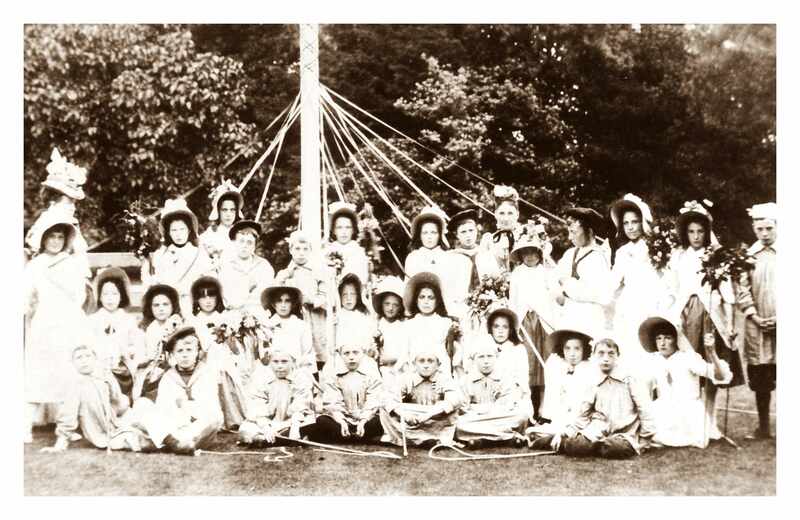 Below are given the names of the children taking part in the Maypole and other dances: – Cissie Evans, Alice Williams, Harriet Canham, Hilda, Maggie and Emmie Kemp. Gladys Meadows, Truda and May Taylor, Maudie Taylor. Pattie Griffiths, Amelia Coventry, Gertie Booth, Ivy Scarrett, Grace Wharam, Nellie Thompson, Susie Hunter. Gertie Jones, Joyce Smith. Hetty Young, Ethel Thackeray, Annie Fewtrell, Cissie McFarlane, and Bessie Williams. In the same year the Liberal Club moved to new premises and the building was renamed the Neston Institute and leased to the Congregationalists. 1940s. St Winefride’s May Queen, Teresa Lavender, first left, and Joan Southwell, Vera Foy and Margaret Hartford. 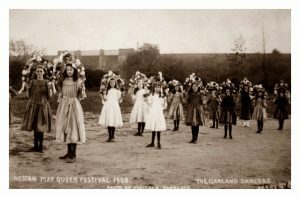 The tradition of dancing around the maypole and crowning a May Queen was, however, continued by some local schools and churches. 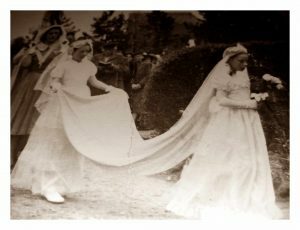 St Winefrides Catholic church, certainly in the years after the Second World War, continued the tradition of crowning a May Queen. Thanks to Marie Birch for permission to use photographs of her mother, Teresa Lavender, and to Susan Chambers and Wendy Wright for images of Neston May Queens and attendants in 1906 and 1908. [These are subscription or pay-as-you-go services but may be used free of charge in many libraries including Cheshire Libraries.